A natural gas pipeline exploded at the Ross Barnett Reservoir in Mississippi on Wednesday morning, causing a massive fire, local US media reported. There have been no immediate reports of injuries. The explosion occurred at around 6:15 am local time (12:15 p.m. GMT) in the city of Brandon in Rankin County, Mississippi, according to the county's sheriff's office, 16 WAPT News reported. The TV station said its weather team could see the smoke on radar and flames were shooting into the air more than an hour after the explosion. The fire burning out of control has also been reported by local Clarion-Ledger newspaper. The pipeline belongs to the Gulf South Pipeline, according to WAPT. The system transports gas between several states, including Texas, Louisiana, Alabama, Mississippi, and Florida. Crews at the scene have shut off the gas following the explosion, company officials said. "They are waiting for the gas to bleed off, and then they will go in and finish putting out the fire," Rankin County emergency official Beth Miller said, 16 WAPT news reported. Mississippi News Now reported that its aerial filming captured the fire as it went out, leaving a scorched patch of forest. 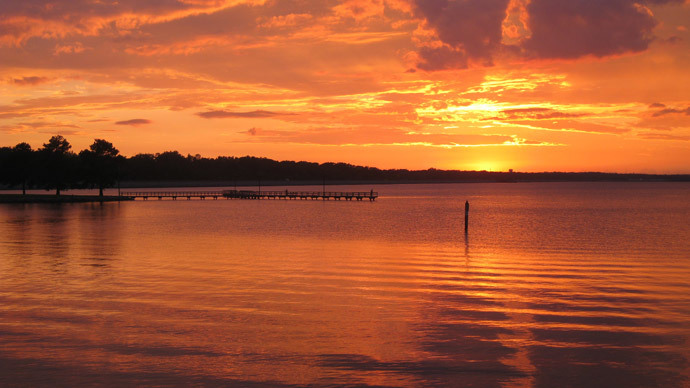 The Ross Barnett Reservoir, known locally as "The Rez," is a 33,000-acre artificial lake that serves as Mississippi’s largest source of drinking water. Constructed in the 1960s, it is a major recreational and residential area, with around 5,000 homes being located along the Rez in Madison and Rankin counties. According to 16 WAPT, citing reservoir manager John Sigman, the gas pipeline is not actually on reservoir property, but is nearby it.